Why Be Curious? 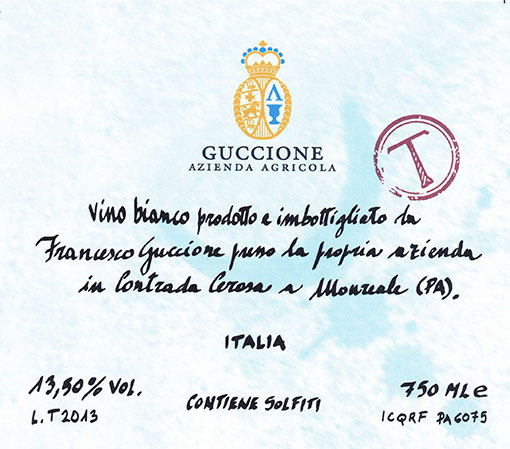 With Guccione’s terre brune (a rusty-brown terroir of clay, chalk, and iron) and a little skin contact in the winemaking, the all-too-often plain-Jane Trebbiano blossoms into a gorgeous seductress. It’s a savory wine that feeds all kinds of appetites. Cantina / Cellar: Fermentation with native yeasts, including two days of skin contact, in a combination of stainless steel tanks and 3000-liter tini (large, upright wooden casks). A year of aging in the same combination of stainless steel and tini. No filtering or clarification. Il Vino / The Wine: The skin contact gives texture and complexity without heaviness. An uncommonly deep Trebbiano, and one that ages magnificently for five to 10 years. A Tavola… / At the Table… Fish of all kinds, including sushi, lighter pasta dishes, and white meats. When young, the wine retains the freshness that you want from a “serious” aperitivo. Ettari / Hectares: 2.8 ha. Età delle viti / Vine age: About 30 years old. Densità / Planting Density: 1100 vines/hectare. Allevamento / Trellis system: Tendone (overhead trellis, or pergola). Fermentazione alcolica / Alcoholic fermentation: Spontaneous, with two days of skin contact, in a combination of stainless steel and 3000-liter tini (large, upright wooden casks). Fermentazione malolattica / Malolactic fermentation: Yes, also in stainless steel and tini. Affinamento / Élevage: One year in a combination of stainless steel and tini, plus additional months in bottle. Zolfo / Sulphur: 20 mg/L total, 6 mg/L free. Produzione annua / Annual production: Usually 10,000 bottles, in cases of 6 bottles each.